Meet Francesco Sanapo, Coffee-in-Chief of Ditta Artigianale in Florence, Italy, and the roaster for our September Superlatives. Francesco was kind enough to sit down for a quick chat with us, talking artisanship, customer interactions, and Matt Perger’s WBC score. You can read a little more about the coffee they roasted for us here. Order yourself a bag here (if available still!) of this months Superlatives, or sign up for the subscription. Francesco Sanapo started his journey in coffee thanks to his father. “He has been my first master and with him I moved my first steps in the right direction”. This direction took him away from his homeland in Apulia, in the south of Italy, relocating to Florence. There he started working as a runner in a bar, attending classes on coffee and hospitality. At 20 years old Francesco “thought of myself as one of the best baristas in Italy.” With this belief and his certificate in coffee and hospitality, he entered into his first barista championship after a friend proposed he compete. Francesco first dreamed of creating Ditta Artigianale in 2008. Sitting in class studying coffee for his certificate, Francesco clearly remembers the moment he recognises as the true starting point of his career in specialty coffee. “I was just starting to understand what specialty coffee was. In that class there was also an older gentleman. He told me how he thought the artisanal skills in the coffee market were disappearing. He kept telling me coffee was no longer perceived as it once was.” From this conversation Francesco followed a thread that would lead to Ditta Artigianale. He wanted to bring a new light of craftsmanship to the world of coffee, “with a modern and scientific approach.” This is quite an undertaking considering the stark contrast of Italian coffee culture, with its dogmatic adherence to tradition, at odds with this modern scientific approach. “It wasn’t easy, as traditions are very hard to change. Italians have been used for years to a bitter taste rather than a fruity one. But a key aspect on this matter is the kind of attitude you have behind the counter: customers have to be intrigued by something new and not have the impression you are teaching them something,” Francesco says. Ditta Artigianale translates to “Artisanal Factory”. The name arose from a belief started from his conversation with the older gentleman during class. Creating something to intrigue customers, to Francesco’s mind, requires a passion for craftsmanship. “I love everything that’s made with care, with the heart, with the hands. Moreover, I think that my country is well known in the world for the beauty of its craftsmanship.” In high volume environments, with an emphasis on the industrial production of coffee, it’s easy to see how this passion for craftsmanship could translate to an environment conducive to intrigue and learning. Ditta Artigianale is “a company with an international vision with Italian soul”. Sitting on the intersection of traditional Italian coffee culture and third wave specialty coffee, Francesco has certainly not chosen an easy path. Their international vision translates to a simple philosophy to roasting. From Francesco: “we prepare the coffee we like most”. 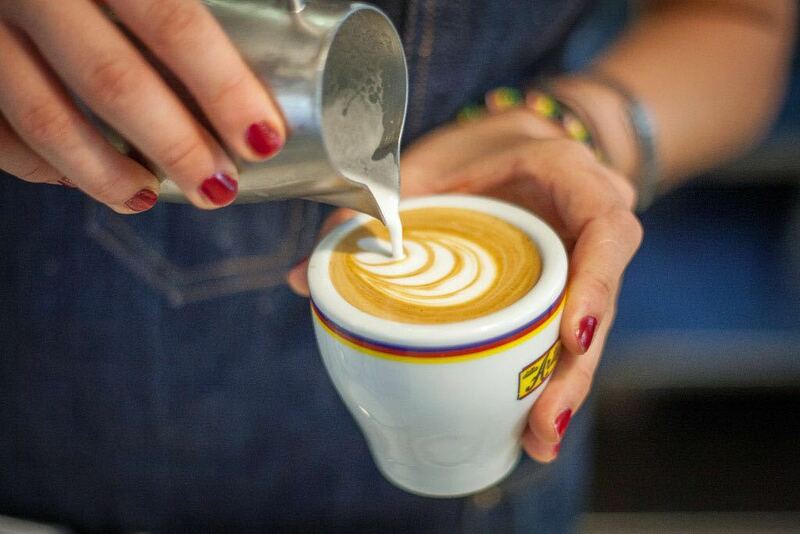 This allows everyone at Ditta Artigianale to be confident in their coffee, serving it with enthusiasm and passion. Most of the coffee they serve is the result of direct trade and relationships with coffee producers. They spend around three months each year in origin countries looking for great coffee. While there they try raise the quality of the producers coffee, engaging in new educational classes or by suggesting new agricultural technologies. “We always try to work with products that are sustainable in all their aspects, respectful of the planet and of all of the production chain, from the producer to the consumer”. While it would be difficult to find a specialty coffee roaster who doesn’t believe in these sustainable practices, speaking with Francesco you can see he’s fully aware of the responsibility to faithfully represent the coffee these farmers produce. This feeds directly into pride and confidence with which they serve and sell their coffee at Ditta Artigianale. A clear line of communication and collaboration with farmers at origin allows for that. “We want to know everything that’s happening in the plantation and, sometimes, we work directly with the producer to make something unique and exclusive.” But Francesco has never forgotten that first lesson he received in humility. “Don’t think that the customer doesn’t understand anything of coffee. In this way you will only obtain the opposite reaction; people will be storming away from your bar.” In an approach that has to contain a fair amount of patience, Francesco prefers to engage the customer in a different way. “I remember the first week we opened; a customer found out our espresso cost 1.50 euros instead of 1 euro, like any other bar in the city. He told us we were stealing his money. He predicted our bar would close within the next six months and added we would never see any kind of success. Six months later I met this person again, in front of our bar.” You’d think this would be the moment you raise your arms expansively pointing at your still-standing bar, at the success the place has enjoyed, and at the very least make it clear you’re still here. Francesco tried a different tact. This is not a model that will work with everyone, but it does illustrate a clear point with specialty coffee: humility, and a willingness to engage people where they stand right now, offers an opportunity to lead them to where you want them to be. All sappiness aside, Francesco may not have ranked better than Matt Perger at the WBC, but he’s arguably achieved something much harder. In the heart of the traditional Italian coffee landscape, he’s turning one customer at a time into a lover of specialty coffee. There’s something to learn from that.